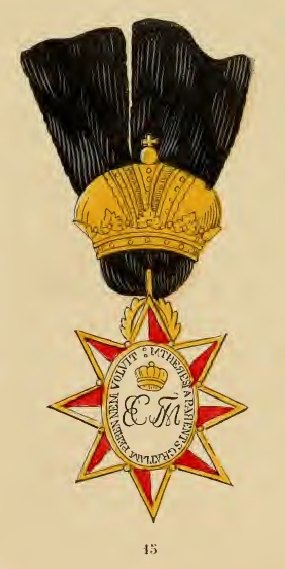 The Order of Elizabeth Theresa, the second Military Order of Austria, was founded, in 1750, by Elizabeth Christina, relict of the Emperor Charles VI The number of the Knights was originally limited to twenty officers, from the rank of Colonel up to that of General, who had loyally served the House of Austria for a term of thirty years; but it was increased to twenty-one in 1771, by the daughter of the founder, the Empress Maria Theresa, at the time when the Order was renewed and underwent some modifications. The Order consists of three classes, the first of which numbers six, the second eight, and the third seven Knights ; it is endowed with a revenue of 16,000 fl. (£1,600), out of which the members receive pensions of 1000 (£100), 800 (£80), and 500 fl. (£50) respectively. When a vacancy occurs, by decease or otherwise, the War Department sends in a list of eligible candidates, having exclusive regard to merit, without distinction of birth, country, religion, or the possession of any other order, and from that list the Emperor makes his choice. The badge (No. 15) is an octagonal star set in gold, the points of which are enamelled partly red and partly white ; in the middle is an oval scutcheon with a golden edge, round which is inscribed : "M. Theresa parentis gratiam perennem voluit" (Maria Theresa wished to give perpetual duration to the gracious favour of her mother), while the centre contains, beneath the Imperial crown, the initials in monogram, "E. C. and M. T." (Elizabeth Christina and Maria Theresa). All the Knights wear it, without further distinction, appended to an Imperial Crown at the button hole of the left side, suspended by a black silk ribbon. Annually on the 19th November (the feast of St. Elizabeth) solemn high mass is held in the Church of the Augustine Friars, at Vienna, in the presence of all the Knights, Generals, Staif and Sub-Officers of the Vienna garrison. The Catholic Knights are bound to say three times every day, a Pater Noster and Ave Maria for the deceased founder, and the reigning sovereign ; while the non-Catholic Knights pay annually three ducats by way of alms for the InvaHd Institution at Vienna.